Whether you’re starting from a built-in template or updating one of your own, Word's built-in tools help you update templates to suit your needs. To update your template, open the file, make the changes you want, and then save the template. In Microsoft Word, you can create a template by saving a document as a .dotx file, .dot file, or a .dotm fie (a .dotm file type allows you to enable macros in the file). Double-click This PC. (In Word 2013, double-click Computer). Make your templates flexible by adding and configuring content controls, such as rich text controls, pictures, drop-down lists, or date pickers. For example, you might create a template that includes a drop-down list. If you allow editing to the drop-down list, other people can change the list options to meet their needs. Note: If content controls are not available, you may have opened a document or a template that was created in an earlier version of Word. To use content controls, you must convert the document to the Word 2013 file format by clicking File > Info > Convert, and then clicking OK. After you convert the document or template, save it. Before you can add content controls, you need to show the Developer tab. Under Customize the Ribbon, select Main Tabs. In the document, click where you want to insert the control. On the Developer tab, in the Controls group, click Rich Text Content Control or the Plain Text Content Control . On the Developer tab, in the Controls group, click Picture Control . To create a list of choices, click Add under Combo Box Properties or Drop-Down List Properties. Type a choice in the Display Name box, such as Yes, No, or Maybe. Repeat this step until all of the choices are in the drop-down list. Note: If you select the Contents cannot be edited check box, users won’t be able to click a choice..
You can use building block controls when you want people to choose a specific block of text. For example, building block controls are helpful if you’re setting up a contract template, and you need to add different boilerplate text depending on the contract’s specific requirements. You can create rich text content controls for each version of the boilerplate text, and then you can use a building block gallery control as the container for the rich text content controls. On the Developer tab, in the Controls group, click Building Block Gallery Content Control . Click the content control to select it. Click the Gallery and the Category for the building blocks that you want to make available in the building block control. Select the content control, and click Properties in the Controls group. In the Content Control Properties dialog box, choose whether the content control can be deleted or edited when someone uses your template. To keep several content controls or even a few paragraphs of text together, select the controls or the text, and then click Group in the Controls group. For example, perhaps you have a three-paragraph disclaimer. If you use the Group command to group the three paragraphs, the three-paragraph disclaimer cannot be edited and can be deleted only as a group. Instructional text can enhance the usability of the template that you create. You can change the default instructional text in content controls. You can add protection to individual content controls in a template to help prevent someone from deleting or editing a particular content control or group of controls, or you can help protect all of the template content with a password. Open the template that you want to add protection to. On the Developer tab, in the Controls group, click Group, and then click Group again. Open the template that you want to assign a password to. Use strong passwords that combine uppercase and lowercase letters, numbers, and symbols. Weak passwords don't mix these elements. Strong password: Y6dh!et5. Weak password: House27. Passwords should be at least 8 characters long. In general, longer a password is, the more secure it is. A template is a document type that creates a copy of itself when you open it. For example, a business plan is a common document that is written in Word. Instead of creating the structure of the business plan from scratch, you can use a template with predefined page layout, fonts, margins, and styles. All you have to do is open a template and fill in the text and the information that is specific to your document. When you save the document as a .docx or .docm file, you save your document separately from the template on which it is based. In a template, you can provide recommended sections or required text for others to use, as well as content controls such as a predefined drop-down list or a special logo. You can add protection to a section of a template, or you can apply a password to the template to help protect the contents of the template from changes. You can find Word templates for most kinds of documents on Office.com. If you have an Internet connection, click the File tab, click New, and then click the template category that you want. You can also you can create your own templates. You can also add content controls such as a date picker, instructional text, and graphics that you want to appear in all new documents that you base on the template. Give the new template a file name, select Word Template in the Save as type list, and then click Save. Note: You can also save the template as a Word Macro-Enabled Template (.dotm file) or a Word 97-2003 Template (.dot file). Under Available templates, click New from existing. Click a template or a document that is similar to the one that you want to create, and then click Create New. Make the changes you want to the margin settings, page size and orientation, styles, and other formats. You can also add content controls such as a date picker, instructional text, and graphics you want to appear in all new documents that you base on the template. Building blocks are reusable pieces of content or other document parts that are stored in galleries to be accessed and reused at any time. You can also save building blocks and distribute them with templates. For example, you may create a report template that provides your template users with two cover letter types to choose from when they create their own report based on your template. Save and close the template that you have designed just the way you want it and to which you want to add building blocks for template users to choose from. Keep open the template to which you want to add building block options for template users. Create the building blocks that you want to provide to your template users. When you fill out the information in the Create New Building Block dialog box, in the Save in box make sure to click the template name. When you send or make the template available to others, the building blocks you saved with the template will be available in the galleries you specified. You can offer flexibility to anyone who may use your template by adding and configuring content controls, such as rich text controls, pictures, drop-down lists, or date pickers. For example, you might provide a colleague with a template that includes a drop-down list, but your colleague wants to use a different set of options in the drop-down list in the document that he's distributing based on your template. Because you allowed editing to the drop-down list when you added the content control to the template, your colleague can quickly and easily change the template to meet his needs. Note: If content controls are not available, you may have opened a document or a template that was created in an earlier version of Word. To use content controls, you must convert the document to the Word 2010 file format by clicking the File tab, clicking Info, clicking Convert, and then clicking OK. After you convert the document or template, save it. To add content controls, you need to show the Developer tab. On the Developer tab, in the Controls group, click Picture Control. 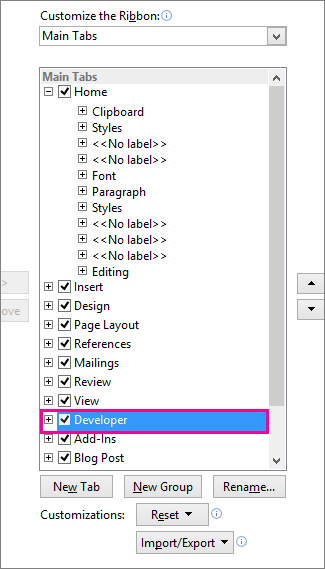 On the Developer tab, in the Controls group, click the Date Picker Content Control. 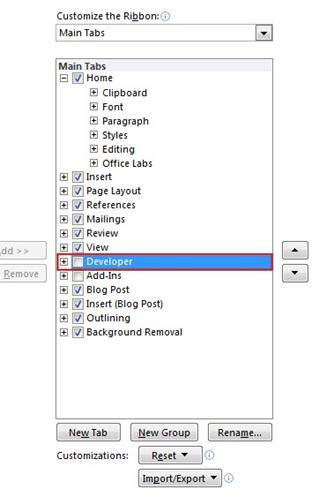 On the Developer tab, in the Controls group, click the Check Box Content Control. On the Developer tab, in the Controls group, click Building Block Gallery Content Control. To keep several content controls or even a few paragraphs of text together, select the controls or the text, and then click Group in Controls group. To select multiple controls hold down the CTRL key while you click the controls. Passwords should be 8 or more characters in length. Open the document that you want. Make the changes that you want to appear in all new documents that you base on the template. Under Templates, click New from existing. Click a template that is similar to the one that you want to create, and then click Create New. You can also add instructional text, content controls such as a date picker, and graphics you want to appear in all new documents that you base on the template. Give the new template a file name, click Word Template in the Save as type box, and then click Save. Note: You can also add content controls to documents. Open the template to which you want to add content controls, and then click where you want to insert a control. On the Developer tab, in the Controls group, click the content control that you want to add to your document or template. For example, you can click Rich Text to insert a rich text control that will appear in any document that is created by using the template. Note: If content controls are not available, you may have opened a document that was created in an earlier version of Word. To use content controls, you must convert the document to the Word 2007 file format by clicking the Microsoft Office Button , clicking Convert, and then clicking OK. After you convert the document, save it. Sometimes it is useful to include placeholder instructions for how to fill out a particular content control that you have added to a template. The instructions are replaced by content when someone uses the template. If you haven't already added a content control to your document, click where you want the control to appear, and then click a control. Note: If content controls are not available, you may have opened a document created in an earlier version of Word. To use content controls, you must convert the document to the Word 2007 file format by clicking the Microsoft Office Button , clicking Convert, and then clicking OK. After you convert the document, save it. Click the content control to which you want to add placeholder text. If you add a text box content control and you want the placeholder text to disappear when someone types in their own text, in the Controls group, click Properties, and then select the Remove content control when contents are edited check box. Building blocks are reusable pieces of content or other document parts that are stored in galleries to be accessed and reused at any time. You can also save building blocks and distribute them with templates. For example, you may create a report template that provides your template users with two cover letter types to choose from when they create their own report based on your template. In the list of editing restrictions, click the restrictions that you want. To choose additional restriction options, such as who can read or change the document, click Restrict permission. Restriction options include setting an expiration date for the document and allowing users to copy content. For example, a business plan is a common document written in Word. Instead of creating the structure of the business plan from scratch, you can use a template with predefined page layout, fonts, margins, and styles. All you have to do is open a template and fill in the text and the information that is specific to your document. When you save the document as a .docx or .docm file, you save your document separately from the template on which it is based. Templates are exactly like documents in that you can provide recommended sections or required text for others to use, as well as content controls such as a predefined drop-down list or a special logo. You can add protection to a section of a template, or you can apply a password to the template to help protect the contents of the template from changes. You can find Word templates for most kinds of documents on Microsoft Office Online. If you have an Internet connection, click the Microsoft Office Button , click New, and then click the template category that you want. Alternatively, you can create your own templates.